Colored jeans are all the rage these days. You could go buy an expensive designer pair or you could make 3 or more different color pairs for the price of one using Tulip Liquid Dyes and your washing machine! Brandi shows you how to get the look in this fun video tutorial. Making these jeans is seriously one of the easiest DIY projects EVER! And we promise, you'll get compliments left and right when you wear your new colorful jeans! That's pretty cool! I didn't know that you could use the dye in the washing mashine and not stain the washer. Very cool. May have to dry this with shirts as well. I also assumed that the washer would get stained. Good to know! This denim jeans is appropriate for any age, the flexibility of a good pair of jeans is apt to make them a favorite in nearly anyone's wardrobe. I have heard first time of liquid dye, Can you brief it, Where to buy ? any drawbacks? Do the pants have to be white? 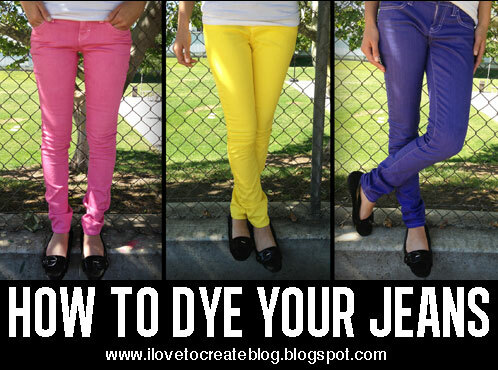 Can you dye blue jeans to a different color?